.. migration data are one of the key components (births, deaths, migration) in estimating and projecting population using model-based methods. It is the most challenging component of population change to project/forecast. Migration data that we can “observe” are important in determining how migration has been trending and how it might change in the future for any given state or sub-state area. State-to-state and county-to-county migration flows data are important in their own right. These data tell us about where the population is moving to or from and can help develop insights into the “why” of migration from one area to another … and learn about net migration flows. In 2013, there were an estimated 548,034 people who moved from a residence 1 year earlier, in a different state, to Texas. 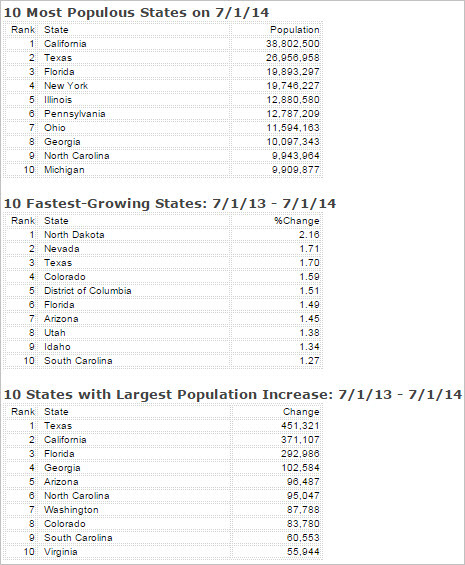 Texas experienced the largest number of movers (inflows) from other states among all states. 66,318 of these movers were from California. Use the interactive table to examine similar characteristics for any state. These data are based on the 2013 American Community Survey. See related data. See the related Web section for more detail about topics reviewed here and interactive access to migration data. The above view shows patterns of New York state outmigration by destination state. See inset legend. Note the legend shows only those states that account for 2% or more of New York out migration. Florida is the largest New York 2013 out migration destination state with 55,419 movers from New York to Florida. Intervals/colors could be changed to any configuration. The label shows total New York state out migration for that state. Expanded view shows detail more clearly. See this related view that shows a zoom-in to east coast area. 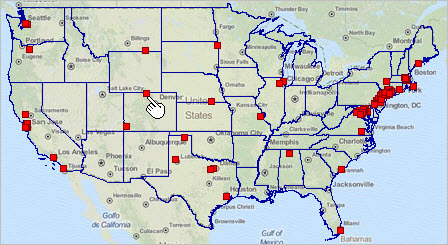 Use the GIS project (see details) to create similar views for any state; visual analysis of outmigration for any state showing outmigration by destination state. Label areas as desired. Add other layers. Add your own data. The American Community Survey (ACS) asks respondents age 1 year and over whether they lived in the same residence 1 year ago. For people who lived in a different residence, the location of their previous residence is collected. The state-to-state migration flows are created from tabulations of the current state (including the District of Columbia) of residence crossed by state of residence 1 year ago. An important reason to use the ACS data to examine migration patterns is because related attributes of the population can also be studied. By using the ACS Public Use Microdata Samples (a sample of individual respondent records), we can also examine patterns of state to state movers who are of a specific race/origin, age group, educational attainment, employment status and many other attributes. In addition, since the ACS data are collected/tabulated annually, these data also provide a means to examine migration trends. Use the interactive table to view, rank, query and compare states based on origin and destination of movers. The following graphic illustrates use of the interactive table to rank California movers (rightmost column) descending order by migration destination state. 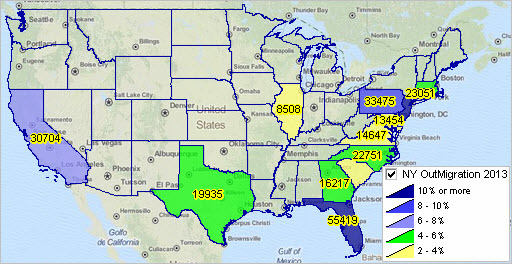 The blue highlighted cell shows that there were 66,318 movers from California to Texas during 2013. It is easy to see the top destination states for any state by clicking the header cell for a state of interest and sorting in descending order. .. state population dynamics are changing. Learn more about how states are changing and why — using tools and resources reviewed here. Examine how these changes might impact you. Births as one component of change … births in the U.S. for the years 2011 through 2014 are estimated at 3.97M, 3.94M, 3.96M and 3.96M (birth rates of 12.80, 12.58, 12.54, 12.46). This relatively flat pattern varies substantially by state and region. The Northeast, Midwest and West regions experienced declining births 2010-14, while the South region had a modest increase. View extensive detail on the population and population components of change in the interactive table below. Sort, rank compare states and regions based on single years or change over time. Use our GIS project to visually examine patterns. Details below. These new 2014 state population and components of change (births, deaths, migration) estimates were released December 23 and will update with 2015 estimates in late 2015. See the related Web section with interactive table and more details. The following view shows patterns of total cumulative state net migration for the years 2011-2014 (7/1/10 to 7/1/14). See inset legend. The label shows total state net migration for the period as a percent of 2014 total population. In expanded view, the top label shows the total state net migration for the period and the bottom label shows total state net migration for the period as a percent of 2014 total population. Use the GIS project (details below) to create views with other population and population components of change or rates for any year or year group. Label areas are desired. Add other layers such as regions or divisions. Add your own data. These data are important. They tell stakeholders how the population is changing, when, and where by state, multi-state regions and for the U.S.; overall. Annual measures of population change provide insights into recent patterns and how the population might change during the next few years. These data do not, in general, tell us why the population is changing. More detailed estimates of state and sub-state 2014 population by age, gender and race origin will be released between now and mid-2015. These historical data, based on facts or near-facts, are used in models to develop projections of how the population size, characteristics and distribution might evolve in the years ahead. The projections need to be updated annually to reflect the more factually based estimates. The models endeavor to capture/specify the why of population change and how change manifests itself by age, gender and race/origin — and the all important where and when. Use the interactive table to view, rank, query and compare states based on detailed characteristics. The following graphic illustrates use of the interactive table to rank states in descending order based on population change 2010 to 2014 (see pointer in rightmost column). The Housing Price Index (HPI) is a popular economic measure available by state and metro in a timely manner with quarterly updates. It fits into many decision-making applications where insights are needed into how housing prices are changing by state, region and metro. This section provides an update on the HPI 2014Q3 and quarterly data for the past year. See the related Web page for more detailed data and access to the HPI data via interactive table. The following graphic shows housing value appreciation 2013Q3-2014Q3 by metro based on the HPI. Click graphic for larger view and details. This view developed using CV XE GIS and related GIS project. Members of the ProximityOne User Group (join now, no fee) may used the CV XE GIS software and GIS project to create similar views with different HPI measures. Zoom-in. Add labels. Add other geography/data. Create views/graphics for reports and stories. The HPI is calculated using home sales price information from Fannie Mae- and Freddie Mac-acquired mortgages, continued upward momentum in U.S. house prices remained strong in the third quarter 2014, as prices rose 0.9 percent from the previous quarter. This is the thirteenth consecutive quarterly price increase in the purchase-only, seasonally adjusted index. As measured with purchase-only indexes for the 100 most populated metropolitan areas in the U.S., third quarter price increases were greatest in the San Jose-Sunnyvale-Santa Clara, CA MSA where prices increased by 6.6 percent. Prices were weakest in the Greensboro-High Point, NC MSA, where they fell 4.4 percent. Eleven of the 20 metropolitan areas with the highest annual appreciation rates were in California. 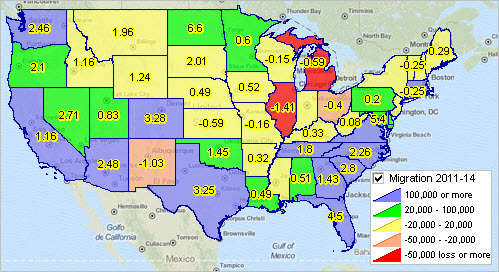 Use the HPI interactive table to view/rank/compare the non-seasonally adjusted “all transactions” HPI for the most recent 5 quarters for all Metropolitan Statistical Areas (MSAs), states and the U.S. The graphic shown below illustrates use of the interactive table to rank all metros in descending order on the percent change over the past year. Quarterly HPI measures are used to updated the interactive table, GIS project and Metro Profiles. Use the calender to view the year-ahead HPI release and integration schedule. .. in the context of “decision-making information,” this section is about using current estimates of the number of children in poverty by school district for each of the more than 14,000 school districts. This measure/estimate is used as a basis for allocation of Federal funds to school districts under the Elementary and Secondary Education Act., the largest Federal school district funding program. These data have far broader uses, providing insights to economic prosperity among children by school district. 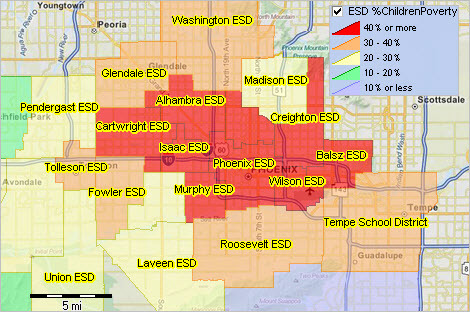 See related Web section for more details and use of an interactive table to rank and compare school districts. View developed with CV XE GIS software. Click graphic for larger view with more details; labeled with percent in poverty. In 2013, 15 percent of all school districts had poverty rates greater than 30 percent for the population of school-age children in families. For the U.S. overall, the number of related children ages 5 to 17 in families in poverty (10,957,266) was 20.4 percent of the total number of children ages 5 to 17 (53,715,325). As of December 2014, we have new 2013 school district estimates of the total population, number of grade relevant children ages 5 to 17, and number of grade relevant related children ages 5 to 17 in families in poverty. These data are based on Census Bureau estimates developed annually under sponsorship of the U.S. Department of Education. These data are used as an input to the allocation formula for Title I of the Elementary and Secondary Education Act. The Title I program distributes funding to school districts based on the number and percentage of low-income children. The U.S. Department of Education will use these 2013 estimates to allocate fiscal year 2015 funds for Title I and other programs to states and school districts for use primarily in the 2015-16 school year. The following graphic shows the grade relevant children in poverty as a percent of total grade relevant children by school district. The following graphic is a view of the interactive table — click here to use interactive table — showing the largest California school districts based on the number of grade relevant school age children. Note the wide-ranging variation in the rightmost column showing the percent of school age children in poverty. Based on the American Community Survey 2013 5-year estimates (ACS0913), ten ZIP Code Areas had a median household income of $250,000 or more during 2009-13. These data were released in December 2014 and will be the most current measure until updated in December 2015. See the list of all ZIP codes showing median household and related measures in this related Web table. This section reviews measures of economic prosperity for all ZIP code areas. 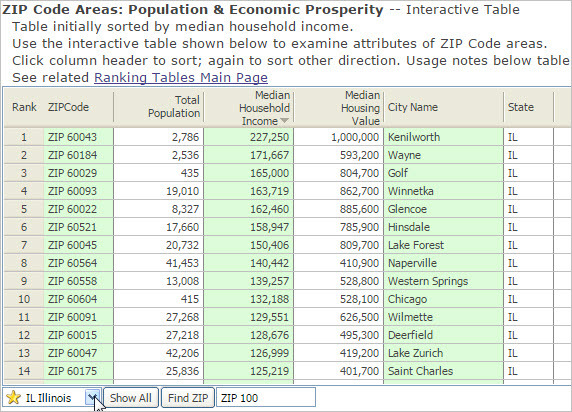 Use the interactive table to view, rank, compare and query ZIP code attributes. 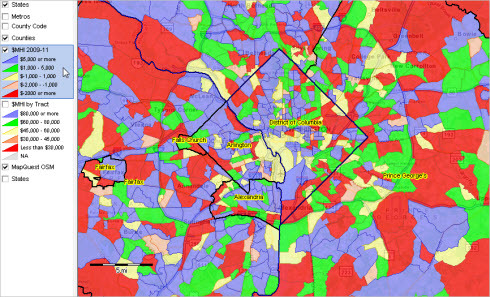 Examining demographic-economic characteristics by ZIP code is important for several reasons. We are familiar with our own ZIP codes as a geographic location. We tend to be interested in our area compared to other areas. ZIP code area provide an easy way to do that. Also, many secondary data resources (such as those reviewed here) are tabulated by ZIP code area; some only by ZIP code area. 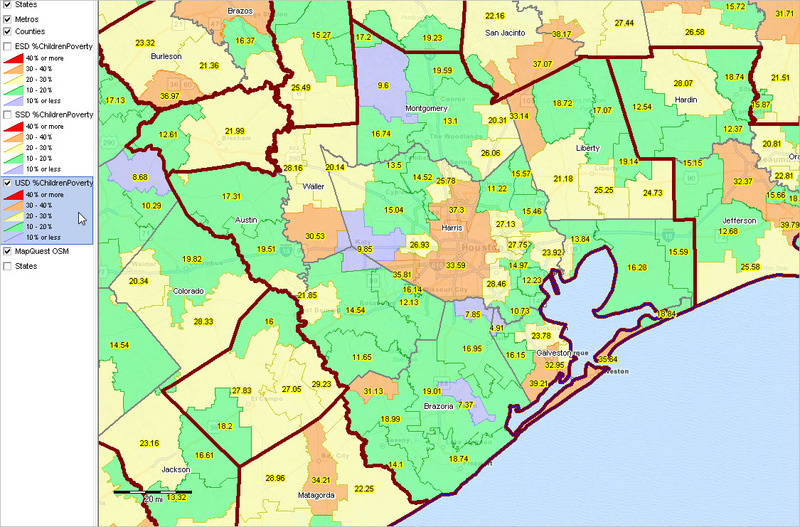 See more about ZIP Code areas. The following graphic shows locations of the ZIP code areas with the highest median household income. The interactive table is located here. The following graphic illustrates use of the table. To rank ZIP codes for Illinois based on median household income, the following steps are used: 1. click ShowAll button (below interactive table), 2. select Illinois (dropdown below table), 3. click Median Household Income header to sort. Join us in the small are data focused one hour no fee Web session. Accessing, integrating and using multi-sourced data for small area geography. .. economic progress since the 2008 recession has been mixed by geographic area. Data from the new 2013 American Community Survey (ACS) provide insights into the characteristics of change at the neighborhood and higher geographic levels. The map shown below illustrates how the median household income (MHI) has changed by census tract based on data from the new ACS 2013 5-year estimates (released December 2014) and data from the ACS 2011 5-year estimates (released December 2012). While there is limited insight into patterns of change in this specific map, it is clear that neighborhoods have changed in different ways. View developed with CV XE GIS. Click graphic for larger view. Examine patterns of ACS 5 year median household income estimates for metropolitan areas of interest. Examples: Philadelphia .. St. Louis .. San Francisco. Select any metro by clicking link in menu section on any metro profile page. This section is about using the new ACS 2013 5-year estimates released December 4, 2014. There are several things to like about the new ACS 2013 5-year demographic-economic data. These data are one year more recent data than released in December 2013 (the ACS 2012 5-year data). As a result, they provide an updated and more current picture. 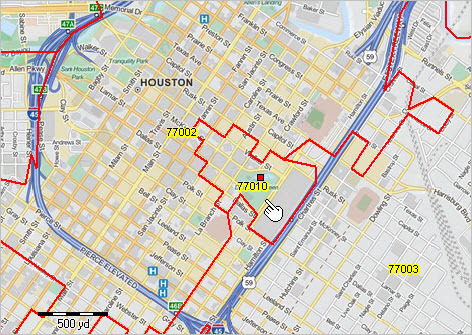 Two, this is a fourth year sequel to having Census 2010 vintage census tract and block group data available. This de facto four year mini-time series enables a start to examine trends. Three, these estimates are centric to mid-2011 and thus roughly update what would have been “richer demographics” from Census 2010 (had the long-form not been eliminated). These data provide unique and powerful measures that facilitate development of decision-making information. 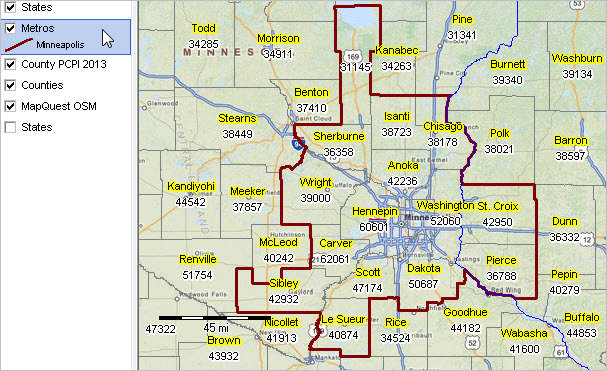 ACS small area data are available for block groups (averaging 1,200 population) and census tracts (averaging 4,000 population) covering the U.S. wall-to-wall. Census tracts are comprised of one or more blocks groups; block groups nest within census tract boundaries. ACS data are estimates based on a sample survey. Based on our experience the quality of the estimates is quite good, but caution should be used. In general, the smaller the geographic area, the higher the margin of error associated with the estimate. The true value of the estimate might be higher or lower by some margin. Second, the 5-year estimates are based on a sample survey conducted over a 5-year period. The ACS 2013 5-year estimates are based on a survey conducted from 2009 through 2013. We might refer to the estimates being “centric to 2011” (the midpoint), but in fact they are estimates for the 5 year period. Caution should be used in examining change based on the 5-year annual estimates. Census 2010 and ACS 2013 provide the most current Census-sourced demographics for wide-ranging geography. 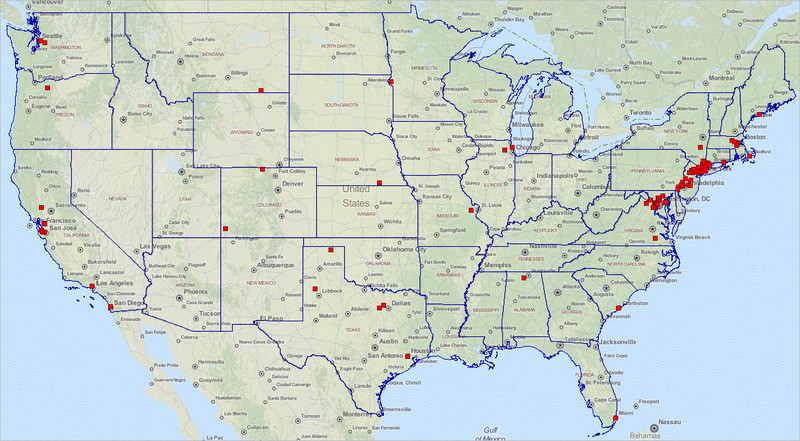 ProximityOne uses the ACS data for continuing analyses and the development of annually updated 5-year projections. There are a wide range of resources to assist users with ACS data access, integration & analysis. Some of these are summarized via the links provided below. The map shown at the top of this section was developed using tools listed in above links. The map view is based on a GIS project that we developed to enable analysis for the U.S. by census tract. Zoom-in to any county or regional to examine patterns and characteristics using the GIS project. Learn more about developing and using this type of GIS project and associated demographic economic data and related analytical tools. Join us in a Decision-Making Information Web session. There is no fee for these one-hour Web sessions. Each informal session is focused on a specific topic. The open structure also provides for Q&A and discussion of application issues of interest to participants. … Among all 917 metros for which per capita personal income (PCPI) was estimated, the Minneapolis-St. Paul-Bloomington, MN-WI metro was ranked number 45 in 2008 and 51 in 2013. The PCPI changed from $47,334 in 2008 to $51,183 in 2013, a change of $3,849 (8.13%). Per capita personal income (PCPI) is the most comprehensive measure of individual economic well-being. This excerpt is from the Minneapolis-St. Paul-Bloomington, MN-WI Metro Profile. The Metro Profile is available for each/all metropolitan areas. The Metro Profile provides insights into characteristics and trends for each metro and is available for all metros. View a metro of interest by clicking a link in the scroll section below. The following map shows the Minneapolis-St. Paul-Bloomington, MN-WI metro with bold brown boundary. Counties are labeled with county name and 2013 per capita personal income. Click graphic for larger view. View developed with CV XE GIS software. See this section to learn about making custom metro maps. The Metro Profiles update frequently. Register to receive update notifications. Next scheduled updates: Dec. 8, 2014 America’s Communities Program ACS 2013 city updates … Dec. 19, 2014 Establishments, Employmnet & Earnings 2014Q2 updates. The Metropolitan Area Profile (Metro Profile), a component of the Situation & Outlook, is a core ProximityOne information resource providing insights into characteristics and trends of current vintage metropolitan areas. Metro Profile is available for all metropolitan areas. The Metro Profile also provides a gateway to drill-down demographic, economic and business data for smaller geographic areas (cities, counties and census tracts) within the metro.